French Wine: The Vouvray Vineyard. Viticulturists. What wil the weather like while visiting vineyards? Wines from the French commune of Vouvray to the east of Tours are made in a wide range of styles from the Chenin Blanc grape. Vintages in the Loire are highly variable, but in the best years Vouvray can produce stylish and very long-lived white wines. Vouvrays come in all shapes and sizes and are redolent of terroir. The basic wines are dry (sec), with crisp fruit flavours, but some of the best wines are made in a demi-sec style that can be aged for decades. In the rare years suitable for the development of noble rot, fully sweet moelleux wines are made. 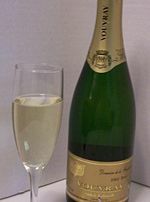 As the still wines have fallen out of fashion, the majority of Vouvray wine is now made into sparkling wines. Vouvray mousseux is fully sparkling, with a bottle pressure over 3.5 bar, whereas Vouvray pétillant is semi-sparkling, with a pressure of 1-2.5 bar. The annual harvest is one of the latest in France, usually occurring in November, and vintages in Vouvray are more susceptible than most to the vagaries of the weather. When the weather is right, the wines can be some of the greatest in France. A seasonal speciality found in the local bars in November is bernache, the first juice that comes from the grapes before they are pressed, which is fermented a little by the natural yeasts on the grapes. Winemaking has been recorded in the region since the fifth century AD. 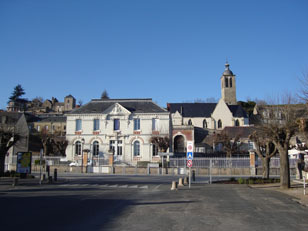 According to legend, Saint Martin of Tours (316/7-397) was responsible for the development of viticulture in Touraine. In particular he reputedly introduced the Chenin Blanc grape, known locally as Pineau de Loire. The Vouvray AOC was designated on 8th December 1936. Its 1800 hectares cover the commune of Vouvray in the département of Indre et Loire, and the neighbouring villages of Chançay, Noizay, Reugny, Rochecorbon, Sainte-Radegonde-en-Touraine (part of Tours since 1964), Vernou-sur-Brenne, and part of Parçay-Meslay. The appellation regulations dictate that the wines must consist almost entirely of Chenin Blanc, but in theory can also contain a small amount of the Arbois grape. .
Vouvray wine information with the French Wine Guide in the Loire Valley.